Brief Synopsis – The story of a platoon of US Soldiers in Vietnam in 1968 seen through the eyes of a new recruit. My Take on it – I still remember the first time I saw this movie; it was on video one night in 1987 (I was 13 at the time). It was very exciting to watch since I knew it had already won Best Picture that year. I can admit now, that I doubt that I understood the movie properly back then, but have been able to do so subsequently due to the fact that I’ve seen it so many times since then. This movie had a very strong impact on my life. In my eyes, it is the quintessential war movie and when I enlisted in the Israeli army in the summer of 1993, I recall that I would envision imagery from this movie whenever on patrol or even combat exercises with my own unit. The most prevalent image (still) was of the platoon walking towards the village about half way through the movie. Each soldier is walking making sure to keep a distance from other soldiers in the unit thus making sure that if attacked, less damage would be done from one bombshell on the unit. It’s interesting what images linger after seeing a movie that can have such an impact on one’s life. I still wonder today, how much of the movie is semi-autobiographical of Oliver Stone’s time in Vietnam and how much is pure fiction. This movie pulls no punches in showing the gruesome reality that the US soldiers had to endure every day in Vietnam. They didn’t know who was friend or foe and it many times caused many casualties. There were soldiers who therefore treated everyone as the enemy and those who tried to stick up for the rights of the unknown. This movie showed both sides of that conflict and I think it does a good job of showing the harsh realities faced by soldiers in an unfriendly combat situation. Funny timing to see this reviewed of all old movies, since I just brought it up as an example of a great faster-paced 80’s movie (comparing it to Apocalypse Now). Classic. 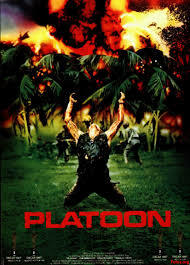 Excellent review, you’re right about the many images that haunt the mind after viewing Platoon. I think thats why this film resonates so much with everyone. I saw it again recently. Better than I remembered. The strongest part of the film is the first half hour, when Chris is a raw recruit and almost certain to get killed. It really captures the chaos, incompetance and indifference to human life you develope if you’ve been in a war long enough. Later I think it gets a bit too bogged down in the good vs. evil, hippies (blue America) vs. rednecks (red America) dichotomy.